I’ve always believed that family members need to be involved in a child’s education, but have often encountered parents anxious about their child’s progress but confused by school reporting language, or lured by expensive ‘teach your child to read’ kits. So I was delighted to receive a review copy of Raise Your Child to Read & Write. I love the idea that this book is for parents, carers, grandparents, aunts, uncles and the wide whanau. Raise Your Child to Read & Write is just the book they need. 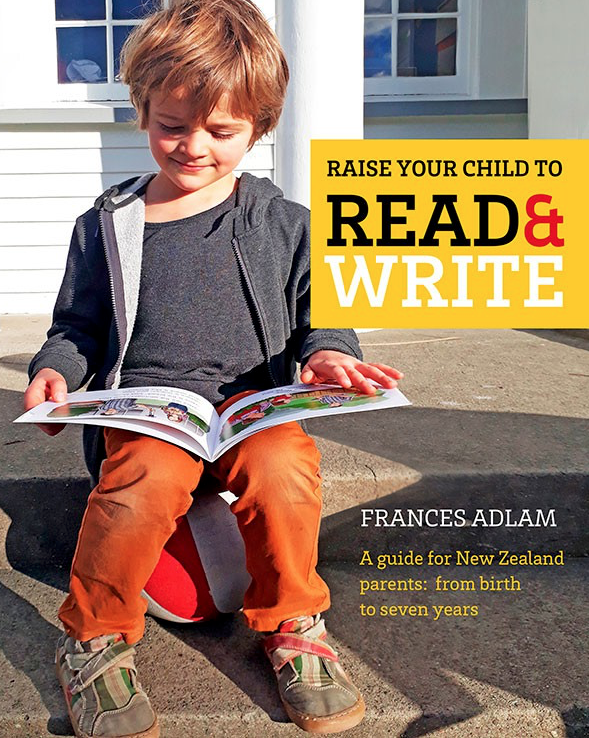 The author, Frances Adlam, successfully uses straightforward language to address common myths about learning to read and write and to provide some simple descriptions of children’s developmental stages. The bulk of the book is taken up with the developmental stages of learning to read and write. For each stage the author describes activities for families under headings such as “talk to your toddler”, “sing to your young child”, “read to your baby” and so on. It’s easy for the reader to find their child’s age and stage and identify simple activities to prepare their child for the hard work of reading and writing. I particularly liked the sections headed “Good Enough Parenting” – an acknowledgement that parenting can be a tough job at times and that there are ways to promote learning without parents doing all the work themselves. The author also includes sections on raising bilingual children and how to help “out-of-the-box” children, such as those that are dyslexic or have ADHD. Raise Your Child to Read & Write promotes learning through play. Play is how all young mammals learn (think of lion cubs in a David Attenborough documentary) so this makes sense. But it’s also wonderful for adults to indulge in child’s play too. Playing brings out our creativity, reduces stress, promotes laughter – it’s got to be good for all of us! The suggested activities are almost certain to include ideas which are either new or provide a fresh perspective, and should give parents confidence that by incorporating them into their interactions with their child, they are promoting the skills a reader and writer needs to develop, while having fun at the same time. For parents and grandparents anxious that play might not be enough, the author supports her approach with what the latest science says about children’s development. The sub-title of the book makes clear that this book covers birth to seven years. I hope someone will take up the challenge of the writing about the over-sevens. We know that parents read to their children less as they get older, but also that the material children read and need to write gets much more complex. I wish, therefore, that the author hadn’t suggested that up-to-seven a child is ‘learning to read’ and over-seven ‘reading to learn’, as that rather seems to imply the business of learning to read is over at seven. Parents need to continue to read with their over-seven year olds, play word games and so on. If they follow the ideas in this book for the under-sevens, I’m sure they’ll be having so much fun that they’ll want to continue, and will enjoying reading more sophisticated books with their children as well as continuing to play games. A minor oversight is the absence of a New Zealand website in the list of recommended websites for Children’s Books. I hope this will be remedied in a reprint. New Zealand books are an ideal source of familiar activities, landscapes, tales and animals, and are likely to include te reo Māori, all of which make them books that are easy to connect to the world of New Zealand children. There are many good sources of information about New Zealand Children’s books including The Sapling and the New Zealand Book Council’s School Library.